Heather Mac Donald is author of The Burden of Bad Ideas and Are Cops Racist? and lives in New York City. Victor Davis Hanson's most recent book is A War Like No Other; his syndicated column appears in newspapers throughout the country. He lives in Palo Alto, California. Steven Malanga's most recent book is The New New Left. He lives in New Jersey. All three are contributing editors of City Journal. USA Radio's "Point of View"
Radio America's "Michael Reagan Show"
WTIC's "Mornings with Ray and Dianne"
KSFO's "Lee Rogers and Melanie Morgan Program"
Accent Radio Network's "Lynn Breidenbach Show"
KSTE's "Armstrong and Getty Show"
Clear Channel Communication's "Drudge Radio"
"The Small Business Advocate with Jim Blassingame"
Salem Radio Network's "Bill Bennett's Morning in America"
Talk Radio Network's "Laura Ingraham Show"
Westwood One's "Jerry Doyle Show"
WIBA's "Upfront with Vicki McKenna"
Radio America's "Randy Tobler Show"
Westwood One's "Lara Larson Show"
Westwood One's "Jim Bohannon Show"
Hillary Clinton helped to elevate immigration to a central position in the Presidential election when she waffled on the question of whether she favored drivers' licenses for illegal immigrants. Yet much of the public discussion that has followed Clinton's confrontation with questioner Tim Russert has focused only on illegal immigrants. We still know very little about what the candidates would do to reform our broken system of legal immigration. . .
Click here to listen to podcast commentary of this piece. "The Immigration Solution is a cogent analysis of our illegal immigration crisis and the public policy choices facing America. This book is a critically important read for our elected officials and the citizens they should be representing." "The Immigration Solution demolishes open-borders myths and provides a clear, sane path toward an immigration plan that benefits America and adheres to the rule of law. Heather Mac Donald, Victor Davis Hanson, and Steven Malanga battle muddled amnesty, advocates with impeccable logic, facts, and principle. This book is not just a must-read. It's a must-do." "In this book, the writers from City Journal again show why that magazine is so indispensable. Having helped change conventional wisdom on the urban problems of crime and welfare, they have now taken a hard look at an issue even more suffused with sentimentality and cliche. 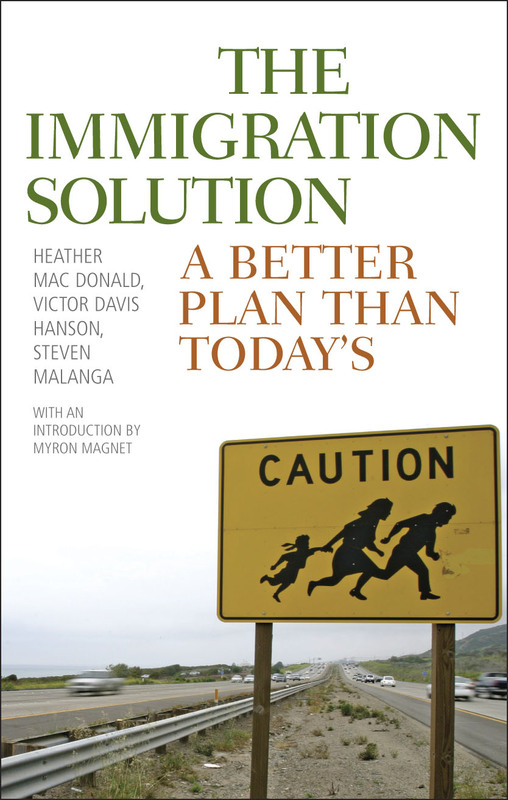 The Immigration Solution is essential reading for anyone seeking to develop an informed opinion on this vital national issue." "The divisive debate over immigration is going to continue for some time to come. Mac Donald, Malanga, and Hanson lucidly present their concerns over the current direction of immigration policy and offer more than a few suggestions for change. Even if you disagree with their preferred policy changes, their suggestions are serious, provocative, and worthy of careful thought—and, regardless of your ideological background, you might actually find yourself nodding more than a few times as you read through the book." NRO: So what is "The Immigration Solution"? Heather Mac Donald: Our immigration solution, in a nutshell: Enforce the laws on the books, and favor immigrants whose education and skills will add more to the national prosperity than they cost taxpayers in health care, education, welfare, and—in too many cases—policing and incarceration. . . As my co-author Steve Malanga explains, Canada and Australia, among other industrialized nations, now give priority to immigrants with technical knowledge and English language ability. Our immigration policy should continue to be welcoming and liberal, but it should seek to import expertise . . .